An estimated worldwide television audience of 650 million people tuned in to watch the 2007 AFC Asian Cup. Australia participated for the first time since moving to the AFC from the OFC. Australia happened to also be the tournament's first nation aside from the co-hosts to qualify for the 2007 Asian Cup. The then-AFC President Mohammed Bin Hammam proposed and presented a move to have four host nations for the 2007 Asian Cup. However, he later regretted this decision and called it his "mistake", citing the financial and logistic difficulties in organising an event across four countries. He said that "It is proving very difficult for [the executive committee as they] have to have four organising committees, four media centres and there are also financial considerations." He also revealed that "[he would] definitely [not do] it [again]", if he had the choice. 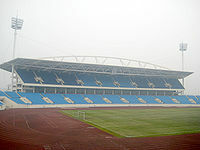 In June 2005, the AFC warned Thailand that it needed to improve its facilities before 2007, otherwise it would be dropped, possibly being replaced with Singapore. 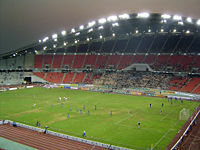 On 12 August of the same year, the AFC confirmed that Thailand would be a co-host of the 2007 Asian Cup. However, in October 2006, Thailand was again warned to improve its facilities in 90 days. The qualification round ran from 22 February 2006 to 15 November 2006. For the first time, the defending champions (in this tournament, Japan) did not get an automatic qualification and had to play in the qualification. Twenty-four nations were split into six four-team groups for 12 remaining spots in the finals. The four co-hosts – Indonesia, Malaysia, Thailand and Vietnam – were granted automatic qualification. For the first time, the seeds are based on the October 2006 FIFA World Rankings instead of the basis of the performance from the previous AFC Asian Cup competition. This was to ensure that the same number of strong teams do not meet in the early stage. The four seeded teams were announced on 19 December 2006. The seeds comprised Pot 4 in the draw. Pot 1 consists of the teams from all co-hosts. On 19 December 2006, the draw was held in the Kuala Lumpur Convention Centre. The Official Match Ball for the 2007 AFC Asian Cup was launched by Nike on 15 May 2007, making it the first time ever that a ball had been launched specifically for any football competition in Asia. The Nike Mercurial Veloci AC features four blue stripes with gold trim with each host city's name inscribed, as well as the AFC Asian Cup logo. 16 referees and 24 assistant referees were officially cleared following a fitness test on 2 July in Kuala Lumpur, Malaysia. One referee and two assistant referees were also named from the CAF. Shamsul Maidin after the referee pulled out with injury. The AFC selected "I Believe", a 2004 single by Thai singer Tata Young as the tournament's official song. The Asian Cup saw many upsets in the early stages of the tournament. In Group A, Oman held favourites Australia to a surprising draw. Oman took the lead and would have won save for an injury time goal from Tim Cahill. Next, hosts Vietnam shocked Gulf Champions UAE with a 2–0 victory. In the same group, Qatar held Japan to a shock 1–1 draw. The result caused Japan coach Ivica Osim to fly into a rage in which he branded his players as 'amateurs' and reduced his interpreter to tears. In Group D, Indonesia continued the undefeated streak of the hosts by defeating Bahrain 2–1. Malaysia ended up as the only host country to drop their match, losing to China 5–1. Thailand recorded just its 2nd win in the Asian Cup finals (their other was in 1972 against Cambodia), and its first ever win in regulation, when they beat Oman 2–0 on 12 July. Meanwhile, Australia was upset by a 3–1 defeat against Iraq the following day, leaving them floundering in the tournament despite high expectations. However, Australia's 4–0 demolition of Thailand at the last match day saw them into the quarterfinals. Vietnam continued to stun all predictions when drew 2006 ASIAD champion Qatar 1–1 while Japan finally thrashed the UAE 3–1. Though, Vietnam was crushed 1–4 by Asian champion Japan last match, but the UAE's 2–1 comeback win over Qatar witnessed Vietnam's first time ever to qualify into the next round, and became the only host to progress through despite being in the group of three champions. On the other hand, while Malaysia continued its poor form with 0–5 and 0–2 loss to Uzbekistan and Iran, thus went out of tournament with no point, China's shocking elimination occurred when they got a hammered 0–3 defeat on the hand of the Uzbeks, despite having drawn 2–2 with Iran and was expected to qualify from group stage with an easy win. Bahrain shocked them whole tournament by defeating South Korea 2–1 in Group D, leaving the Koreans in the verge of elimination when Indonesia was beaten 1–2 by Saudi Arabia. However, South Korea finally progressed with a 1–0 win over host Indonesia, enough to seal them in. In the quarterfinals, Iraq defeated Vietnam 2–0, while South Korea ('Korea Republic') needed a penalty shootout to eliminate Iran 4–2. Japan also needed a penalty shootout to defeat Australia 4–3 (this was the first time Australian 'keeper Mark Schwarzer had ever come out on the losing end of a penalty shoot-out), and Saudi Arabia won over Uzbekistan 2–1. Iraq upset South Korea in the semi-finals by winning 4–3 on penalties, resulting in thousands of Iraqis celebrating in the streets of Baghdad. Over 50 Iraqis were killed by terrorist bombs targeting these crowds. In the other semi-finals, Saudi Arabia topped defending champions Japan 3–2 to make an all-Arab affair for the final match. Iraq went on to defeat Saudi Arabia 1–0 taking the Asian Cup title. Iraqi forward and captain Younis Mahmoud was given the title of Most Valuable Player. South Korea took third place narrowly beating Japan in penalties 6–5. It was the third consecutive match in the tournament that South Korea played 0–0 before a penalty shootout. Iraq, Saudi Arabia, and South Korea, as the top three national teams in the tournament, all received automatic berths to the 2011 Asian Cup along with the next hosts Qatar. .
With four goals, Younis Mahmoud, Naohiro Takahara and Yasser Al-Qahtani are the top scorers in the tournament. In total, 84 goals were scored by 57 different players, with two of them credited as own goals. ^ "Cities fight for Asian Cup motza". Archived from the original on 28 September 2010. Retrieved 18 April 2011. ^ "Thailand confirmed as AFC Asian Cup 2007 co-host". AFC. 12 August 2005. Archived from the original on 15 October 2007. ^ "Thailand handed 90-day Asian Cup reprieve". The Guardian. 17 October 2006. Archived from the original on 17 January 2010. Retrieved 25 October 2006. ^ "AFC Asian Cup 2007 Organising Committee approves team classification for Final Draw". AFC. 19 December 2006. Archived from the original on 23 June 2007. Retrieved 19 December 2006. ^ "AFC Asian Cup 2007 Official Match Ball launched". AFC. 26 June 2006. Archived from the original on 23 June 2007. ^ "Exclusive Pictures: Asian Cup Match Ball". 442 Magazine Australia. 14 May 2007. Archived from the original on 17 January 2010. Retrieved 27 June 2007. ^ "Officials announced for Asian Cup". AFC. 21 June 2007. Archived from the original on 15 October 2007. ^ "Referee Maidin ruled out through injury". AFC. 26 June 2007. Archived from the original on 10 July 2007. ^ "SI believe⬝ - bài hát chính thức của Asian cup 2007" (in Vietnamese). Vietnam Football Federation. 25 June 2007. Retrieved 9 June 2018. ^ a b c d e f "Special AFC Awards for 2007 Asian Cup" (in Arabic). Kooora.com. 29 July 2007. ^ "Toshiba All-Star XI". 18 August 2007. Wikimedia Commons has media related to AFC Asian Cup 2007.